As believers we are called to live on mission. We know that right.? But sometimes it can be so confusing on what that really means and looks like. This series offers a ton of practical ideas of what living missionally can look like. Not every topic is meant for everyone. Our hope is that a few will stand out to you to take a step out and try. And we hope you get to see God show off in how He uses you to influences others for the His glory. Just remember that success is taking the initiative in the power of the Holy Spirit and leaving the results up to God. That frees us up to enjoy the process and take big risks for His glory. I'm (Laura) praying for you each day of the 31 days and I (as well as others) would love to know how it's going. Feel free to share cool stories of God coming through in the comments. 12. How to Live Missionally Where your at Right Now Vlog & FFF Blog Link Up. 25. How to Reach Unreached People Groups with the Gospel through Facebook. Don't miss the series. Sign up here. Did you benefit from this series? Are there things you wish you could come back to? If so, we have a FREE book for you! All of this and more is in our book, Missional Life; A Practical Guide to Living in Light of Eternity. If you liked this series and want these and more we want to give you our new book Missional Life; A Practical Guide to Living in Light of Eternity. We're giving it away FREE to our newsletter subscribers. Just sign up and we'll send it to you. Here's what's in the book. Offer this series as a resource for others. Copy the code below the circle and paste on your blog or website. I'm so happy to have found your site. 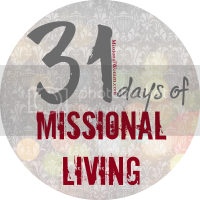 Last year I wrote on 31 Days of Missional Living as well. I can't wait to read your posts. This year I'm doing 31 Days of Missional Meals. No way!!! Can't wait to check it out! My heart beats fast here. You have my attention and oh how I can't wait to be encouraged forward from your words. So excited to read this series! My husband and I are just returning from a ministry sabbatical, during which we spent much time revisioning and planning for ways to help bring our church into a more missional midset. The timing of this series is perfect daily encouragement for me!! Good to see you at 31 Days. I'm super impressed with your well thought out list of posts. I'm looking forward to what you write in this series. You are tapping into things that are on my mind! Looking forward to the series!